This basic idea comes from my mother’s famous “Fried Rice”. 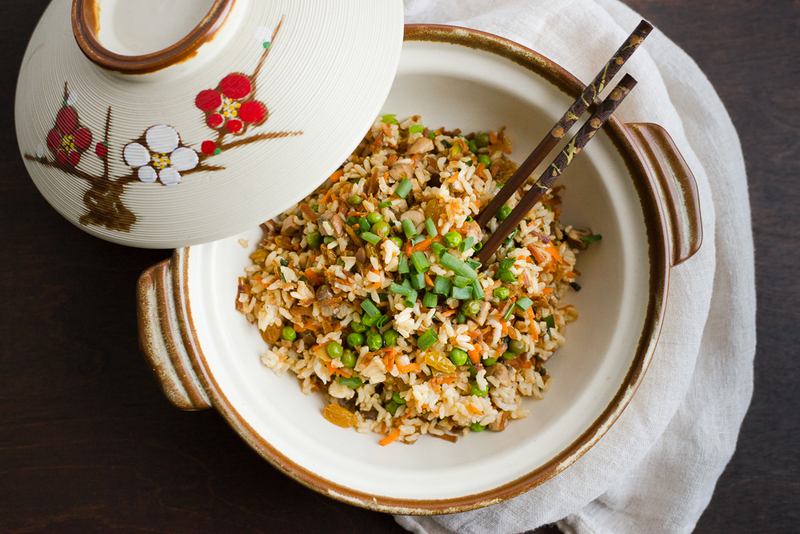 It consists of veggies stir fried with garlic, soy sauce and pepper and mixed into white rice. Add a little sliced omelet on top and some roasted cashews and it’s JUST DELICIOUS. The saltiness from the soy infuses the rice and it’s just such a winner. I have simplified the veggies but know that you can take this basic idea and change it up a bit. For instance, my mom tops hers with scrambled egg and cashews. The recipe is very adaptable, and I have found that you can mix the veggies into quinoa, brown rice, white rice, couscous, or Israeli couscous (the much larger couscous). This recipe is great because if your family does not care for the particular veggie or salad you serve, they are getting a lot of vegetables in this side dish. It’s a great “go to” side. I made this tonight with brown rice and quinoa just to compare the reactions of the Tiny Tasters. I was surprised at how much they liked both, but the quinoa won out. They liked the strange spiral appearance of the quinoa (and the strange name, too!) I was able to fool my “mushroom hater” by running the mushrooms through my mini food processor. They sorted of melted into the background as I sautéed them. I found my quinoa at Costco in a 4 lb bag, and it happened to be organic, too. It’s much faster than brown rice (about 15 minutes compared to about 35-40 for brown rice). Nutritionally it is very similar, but I was surprised to find that quinoa has 20% of the RDA (adult) for iron! If you prefer brown rice but in a faster way, I have used “instant” brown rice. Uncle Ben’s makes one that’s really fast and easy. Prepare vegetables as indicated above. Cook quinoa, rice or couscous according to the package instructions. While it’s cooking prepare veggie mixture. Heat oil in a large nonstick skillet on medium heat. Add garlic and sautee 1-2 minutes until soft, being careful not to burn. Add green onions and sautee another 1-2 minutes. Add carrots and 3 tablespoons of soy sauce and sautee another 2 minutes. Add mushrooms and a sprinkle of pepper and sautee another 2-3 minutes. Add frozen green peas, and raisins and sautee until all of the veggies are warm and soft. If veggies get dry add another splash of soy sauce. When quinoa, rice or couscous is ready turn off heat. Add in veggie mixture and mix gently until incorporated.